On-farm food safety trainings will be held this winter throughout the state. Certificate based third party audit trainings will be offered in Rosenhayn and Chatsworth. 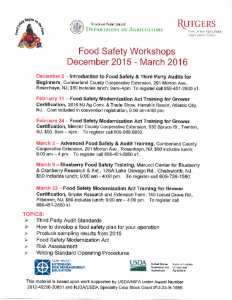 Three additional trainings, located in Atlantic City, Trenton and Pittstown, will offer the required curriculum for compliance with the Food Safety Modernization Act. More information on who will need to comply with FSMA to be published soon, as the final rule was just released and we are working to understand its implications for NJ produce growers. Registration is required for attendance at these trainings!